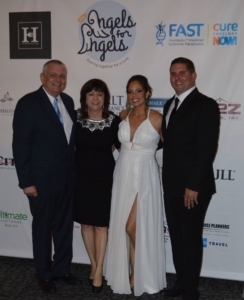 The recent Angels for Angels Charity Gala raised more than $100,000 for the Foundation for Angelman Syndrome Therapeutics (FAST), the largest, non-governmental funder of Angelman Syndrome-specific research in the world. 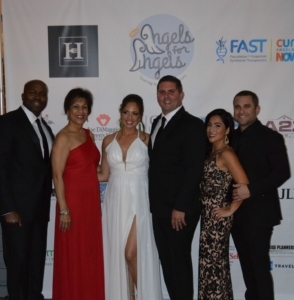 FAST, a registered 501(c)(3), raises money to fuel cutting-edge research and takes an active role in drug development to treat and ultimately cure Angelman Syndrome, a rare, severe neurological disorder that primarily affects the nervous system, delaying development and causing intellectual disability and problems with motor coordination and balance. Guests at the sold-out gala enjoyed musical entertainment by Rock With U, dinner, dancing and a silent auction with gift baskets, vacation getaways, jewelry and more. Dr. Ed Weeber, a pioneer in Angelman Syndrome research and the first scientist to cure AS in his lab, shared updates on his inspiring work. Eslin Guice, whose daughter was diagnosed with Angelman, and her sister Erin Cain were co-chairs. Angelman Syndrome, which affects nearly one half million people in the world including actor Colin Farrell’s son, has been cured in the laboratory using multiple strategies — drug activation of the paternal gene, protein replacement therapy and biologics. Advances in Angelman’s research could have effects on patients with Alzheimer’s, ALS, Rett syndrome and Fragile X syndrome, among others. Sponsors of the Gala were Bloomberg Philanthropies, Harris Restaurant Group, Joe DiMaggio Children’s Hospital, McHale and Slavin, PA, A2Z Roofing, JLL, Ultimate Software, Geo Group, West Central Legal Services, Galt Insurance Group, Tower Hill Insurance, National Property Services, City Furniture, Assist 2 Sell, CSPi, Foley and Mansfield, PA and Cruise Planners.